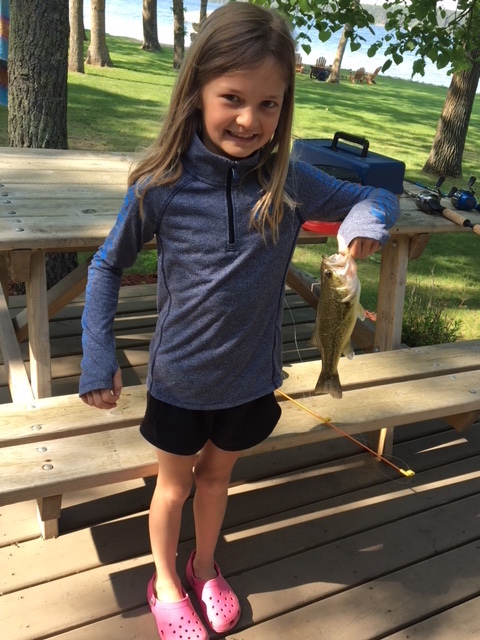 Taylor, age 8, caught this large mouth bass on Memorial Day around 9am near Dakota Shores while fishing with her cousin, Owen. She was using leeches for bait. Taylor loves to fish with her cousins and try to catch the bigger fish! Don't forget to attend the Long Lake Area Association (Hubbard County) Inc Annual Meeting coming up on Sat 6/30/18 at the Hubbard Community Center, Hubbard, MN. All the entries of the Kids' Fishing Contest are eligible for the drawing held at the Annual Meeting. There will be three winners! For details on how to enter your child/ grandchild in the contest click here.